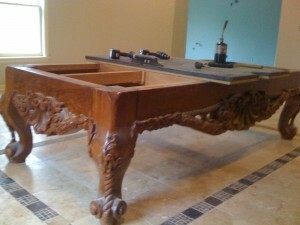 While having a pool table in your home can be tons of fun, moving one can be a hassle. That’s because pool tables are large, yet delicate pieces of furniture with a lot of small, moving parts that can be difficult to move. While you can move a pool table on your own, the job is best left to professionals who can do it properly. That’s because pool tables tend to be very heavy, as they are made from large pieces of slate that need to be disassembled. As such, your best bet is to hire a trained professional mover to take the pool table down, relocate it, and set it back up. However, this service typically does not come cheap, and prices vary based on the distance of the move and the table itself. 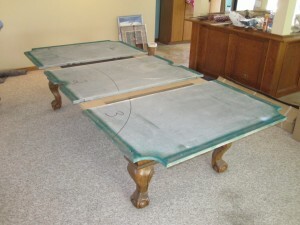 Upon arrival, a professional pool table mover will take the pool table apart by first removing the bumpers and felt, then the slate and the legs. The mover will then wrap the table pieces in moving blankets and / or plastic wrap to ensure it does not incur any dings or scratches. After it is moved, the table will be put back together. If it needs new felt, bumpers, or other parts, this is when additional costs may be incurred. For instance, if the pool table needs new felt, this will add an extra hour to the move, and anywhere between $100 to $500 to the cost. If the table needs a tune-up, such as rail repair, or repairs to pockets or replacement of cushions, this can be an additional expense. So can moving the table upstairs to a hard to reach area, as this can add to the cost. Typically, moving a table takes about three hours. However, there are exceptions. For instance, antique tables, tables over nine feet, or certain styles of tables may take longer to move and be more expensive to relocate due to the complexity of taking them apart. With all of these additional costs, moving a pool table yourself is something to be considered, if you have the manpower. However, this can damage the pool table in many ways, making it unusable. As such, your best bet is to check with a mover for promotions or discounts. If those cannot be found, ask your mover in person, and see if the mover is willing to negotiate a better rate. You can also compare the cost of purchasing a new table vs. moving one, as sometimes a pool table company can provide delivery and setup for free. To conclude, moving a pool table is tricky and requires knowledge, patience, and skill. For that reason, hiring a professional pool table mover is a smart idea, provided that mover has the experience and ability to move your table safely and securely.